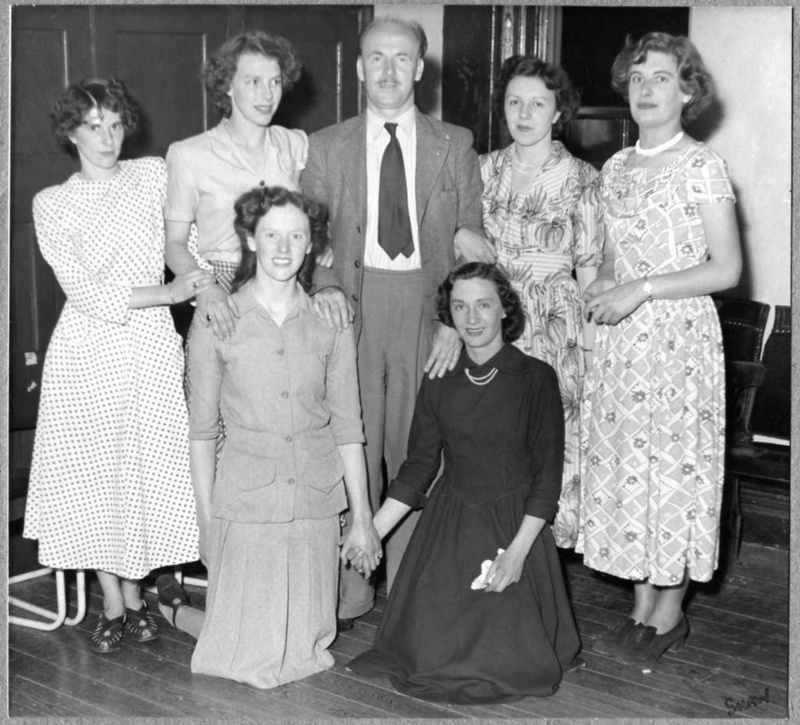 Loftus & District Arts Club (Drama Section) produced ‘Liberation’, this image is from a photograph by Wm. Eglon Shaw (his studio was on North Road, Loftus). 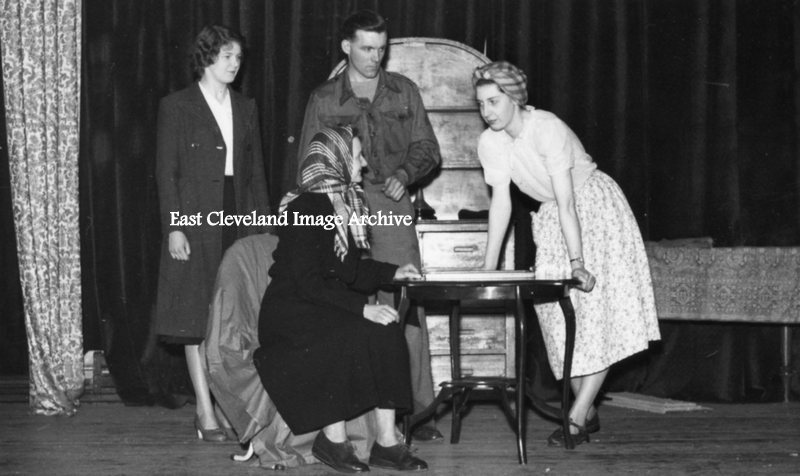 In this scene we have standing: Margaret Wood, William Shaw, Irene Fowle. Seated: Margaret Duffy. Image and names courtesy of Helen Cook (nee Fowle). 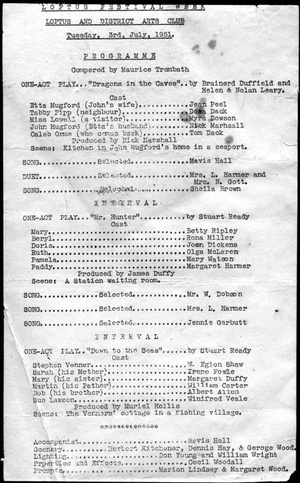 For Christmas 1953, Loftus & District Arts Club (Drama Section) produced ‘The Holly and the Ivy’, we been supplied with most of the names, can anybody fill in the blanks? 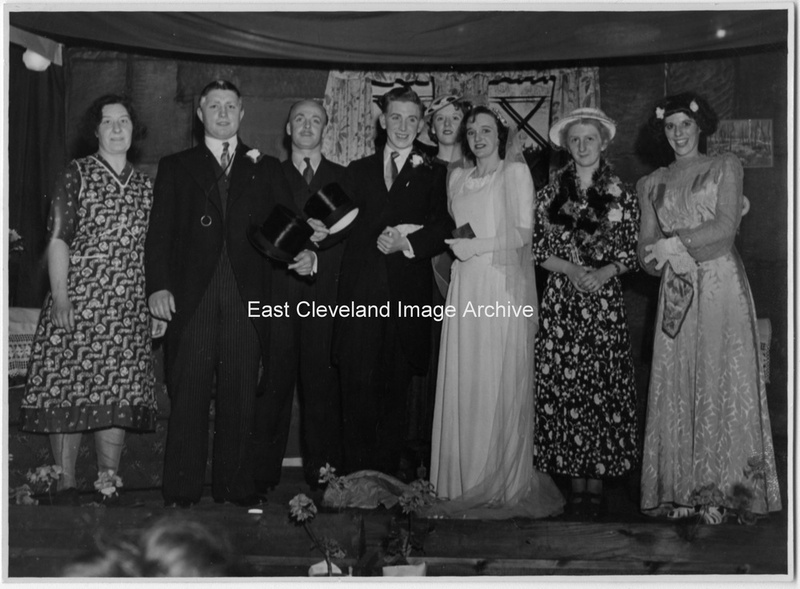 Vera Evans, Irene Fowle, Albert Allan (seated), Charlie Jefferson, Myra Dowson, ? ?, Nick ?. 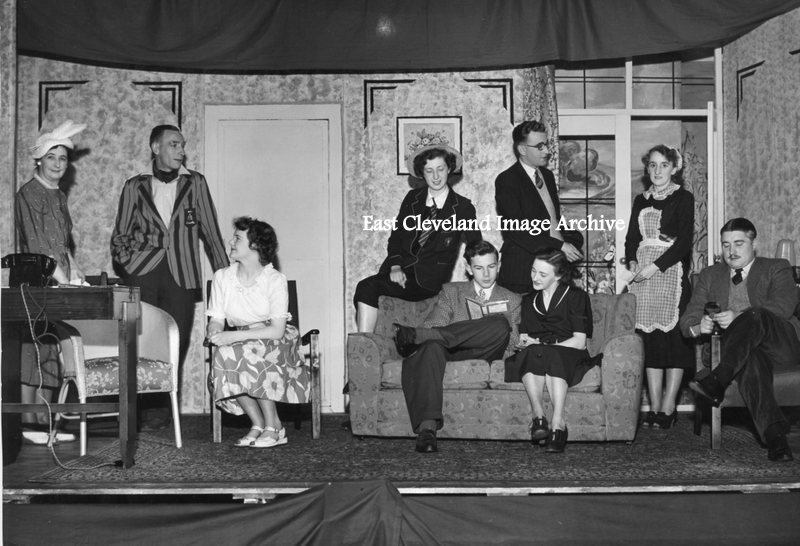 Loftus & District Arts Club (Drama Section) production of ‘A Play for Ronnie’; producer M. Goldsborough, are shown on stage. 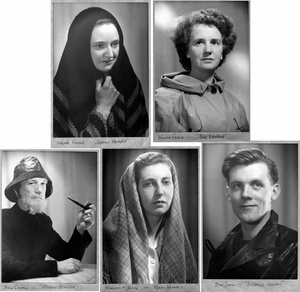 Back row: Muriel Hollis, Lewis Snowdon, Margaret Duffy, Albert Allan, Marion Lindsey. Front row: Margaret Wood, Derick Richards, Irene Fowle, Maurice Trembath. 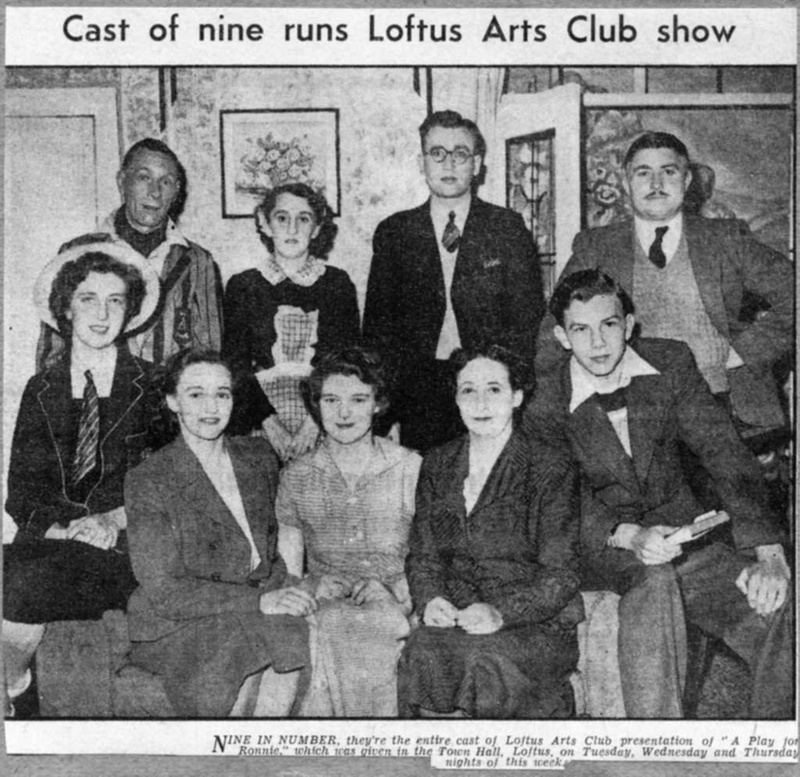 Loftus and District Arts Club presented a Festival programme of three one-act plays on Tuesday, 3rd July, 1951. This image is of the programme of the plays, can you spot your name in the listings, we would love to hear from you. Image courtesy of Loftus Town Crier Group who kindly loaned us a Scrap Book of Loftus and District Arts Club. Image courtesy of Jean Welford and many thanks to Helen for that update..
Loftus Town Crier Group kindly loaned us a Scrap Book of Loftus and District Arts Club that was compiled in 1951 by M.Lindsey and W.Shaw, Camera Section – Joint Secretaries. This image and the following ones are a selection from the book. 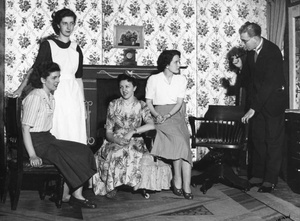 The cast of ”A Play for Ronnie” pictured in the newspaper cutting were:- Mr.L.Snowdon, Marian Lindsey, Albert Allen, Maurice Trembath (standing) and Margaret Duffy, Irene Fowle, Margaret Wood, Muriel Hollis and Derrick Richards (sitting). Miss M.Goldsborough was the producer. Proceeds were in aid of Loftus Festival of Britain Funds. Loftus and District Arts Club presented a Festival programme of three one-act plays on Tuesday, 3rd July, 1951. Musical items were given in the intervals. 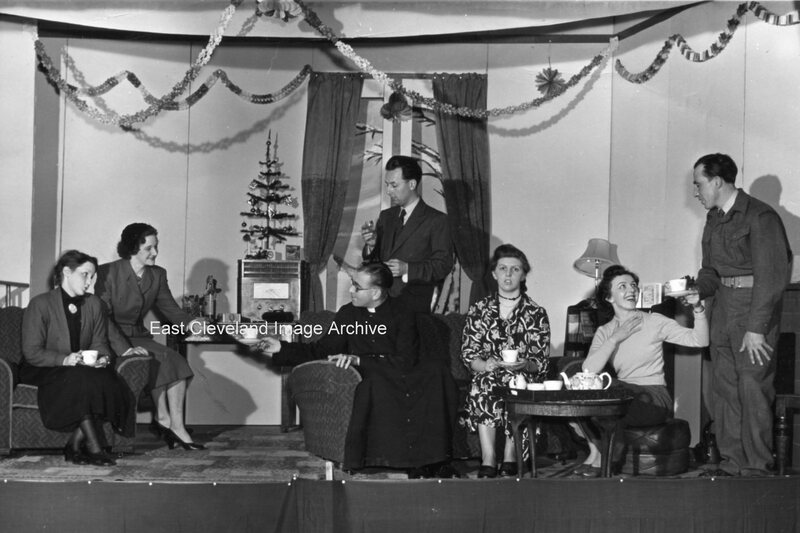 The first play was ”Dragons in the Caves.” After the interval the scene was a station waiting room for the mystery, ”Mr. Hunter”. Jim Duffy, the producer, is pictured with the cast – Joan Dickens, Margaret Harmer, Rona Miller and Betty Ripley (standing), and Olga McLaren and Mary Watson (kneeling). ”Down to the Sea” was the third one-act play in the Festival programme. It was produced by Muriel Hollis and the members of the cast were: Irene Fowle, Winnie Veale, Bill Carter, Margaret Duffy, Bill Shaw and Albert Allen. The scene was the Venner’s cottage in a fishing village. Portraits by Bill Shaw and M. Wood. In this scene from ”The Late Christopher Bean” the actors are:- Myra Dawson, Margaret Duffy, Rona Miller, Vera Evans and Albert Allen. 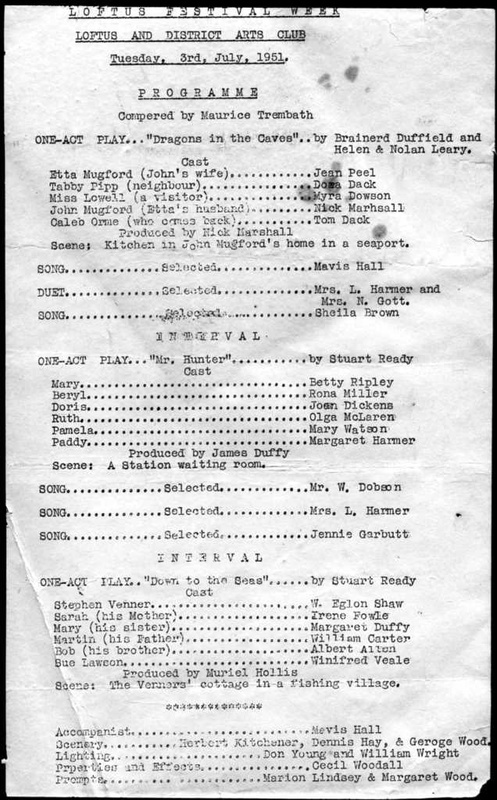 The play was produced by Nick Marshall, who took one of the parts. Bill Shaw, Tom Dack and Maurice Trembath were also in the cast. This photograph was taken by Bill Shaw. 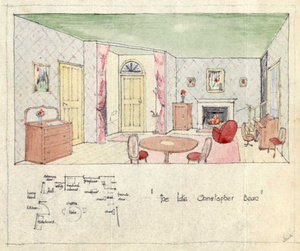 This is a water colour sketch for the design of the set by H.Kitchener.